What Exactly is a Conversion? Before you can work to increase conversions, you should understand exactly what a conversion is. The most basic definition of a conversion is that it is the point when a user completes a desired step. The term conversion can mean a lot of different things, and conversions for your business will be based on your objectives. If you are a political candidate running for office, then a conversion might ultimately mean a vote in an upcoming election. For organizations intent on spreading a specific message, then the desired conversion could be having more users download a free e-book. For an e-commerce website, a conversion might mean clicking a product link, a user placing an item in their virtual shopping cart or signing up for a subscriber email list. Clearly, sales are a big part of operating an e-commerce website. Therefore, conversions are equally important. Think about the shape of a triangle. Now, invert it. That upside-down triangle shape gives us a physical representation of the sales funnel. 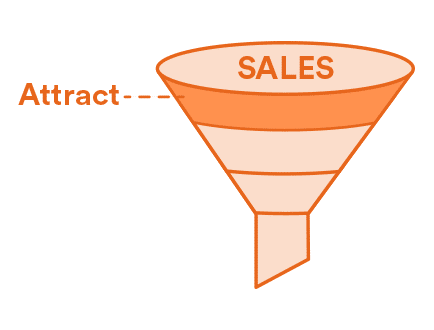 Just like the name suggests, the sales funnel literally funnels down users until it culminates in sales, conversions and repeat customers. In order to truly grasp the value of the conversion, it helps to understand how users get there thanks to the sales funnel. There are four layers, or stages, of the sales funnel. These are as follows: attract, convert, close and delight. Attract is the largest of the four layers, and it is the first step in the process. As you might imagine, this stage is all about attracting as many eyes as possible to your website, your products or your brand. To get more individuals in this stage of the sales funnel, you might begin advertising or marketing campaigns. The more people that see your social media profiles, advertisements on search engines or organic search results, the more people that will begin down the sales funnel. Individuals are aware of your brand and your business once they have entered the sales funnel. This means that they are potential leads, although there is not yet a way to tell whether they will ultimately complete the conversion and move from lead to customer. 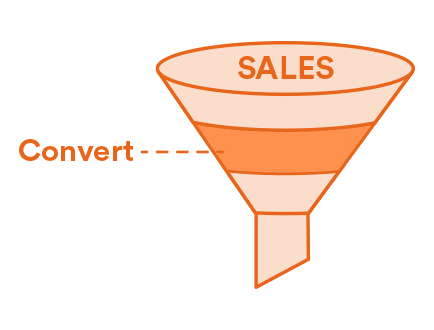 The next step within the sales funnel is convert. This is, hopefully, when people who visit your e-commerce site decide to share their contact information and learn more about your products. Once this happens, individuals go from casual visitors and potential leads to actual leads. Once they have invested in your website enough to share personal information, they are viable leads that could easily become paying customers. 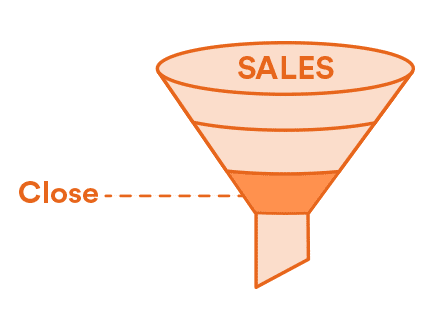 The third step in the sales funnel is close. This is when you are able to officially close the deal and push a lead to become a customer. It goes without saying that this is a critical part of the sales funnel. Without it, there would be no profits for your business. 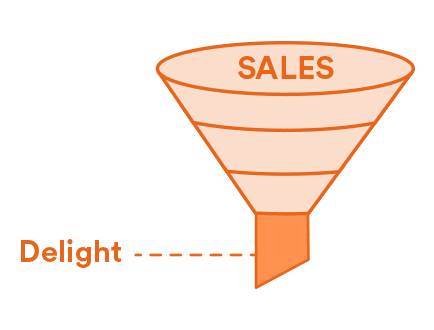 The final step in the sales funnel is delight. This is ongoing and important, but it is often overlooked by businesses. By delighting current customers, you can keep them as repeat customers. Before the sales funnel can ever be completed, you need to work on attracting and converting leads. Clearly, conversions are a key piece of the e-commerce puzzle. Need help creating unique, high-quality content for your conversion strategy? Conversions are valuable for many reasons. To start, they encourage visitors to go further into the sales funnel. In addition, they can provide you with a way to contact leads in the future. Finally, they allow you to analyze the success of your marketing campaigns. In order to have sales, you need to have customers. In order to have customers, you need to have leads. In order to have leads, you need to have conversions. By looking at the process in a matter of fact way, the value of conversions is apparent. Conversions also give businesses something they desperately need: a way to stay in touch. If you have an e-commerce website, or if you are an affiliate marketer, then you know that contact information can lead to future sales. By getting a visitor’s email address, you have a new way to communicate. That email address can be added to your list for email marketing campaigns, which encourage further relationship building. Finally, getting a conversion means you have concrete data to work with. In the world of online sales, analysis is critical to understanding what you’re doing right and what needs work. When you achieve a conversion, you’re getting crucial information about the quality of your advertising, which campaigns are effective and which social media networks deliver the best leads. By compiling and analyzing all this data, your business will be better able to replicate successful results and work toward more conversions in the future. It is easy to look at conversions from the perspective of a business. However, it’s equally essential to understand the customer journey. The customer experience begins at the first stage of the sales funnel, and if someone becomes a repeat customer, it won’t ever end. This potentially long-lasting relationship needs to be nurtured every step of the way. As you’re working toward conversions, think about what you might personally want to share with an e-commerce company. What would it take for you to give them your name, your email address or any other relevant details? Would aggressive steps encourage you to skip the process entirely? Achieving a conversion is a smart goal. However, it isn’t your end goal. Your end goal is achieving and maintaining a stable and positive relationship with a long-term customer. If you have to jeopardize that in order to get a conversion, it’s time to rethink the process. Go through your intended sales funnel from the perspective of a potential customer and ensure that the consumer journey is positive and welcoming every step of the way. Before your business can focus on conversion rate optimization, you need to step back and work on increasing your total number of leads. If your conversion rate is 10 percent and you have 100 leads, then you only have 10 total customers. While increasing your conversion rates is a smart option, you can also work to increase your leads. If you now have 1,000 leads, then a 10 percent conversion rate still nets you 100 total customers. The way to increase your leads is to increase your exposure. Before individuals can learn about your products, your website or your brand, they need to see you online. Think back to the first stage in the sales funnel: attract. By attracting more eyes to your website, you’re better able to yield more leads. Explore some of the many ways to increase leads with these helpful tips. There are over 3 billion searches conducted on Google every single day. Clearly, there are a lot of people who are turning to search engines for the information they need. In order to show up in online searches, your business needs to improve its SEO, or search engine optimization. Search engine optimization means optimizing your content so that it appears in search engine results pages more often. That first search engine results page, or SERP, is often where internet users will choose their next online destination. By appearing on that SERP, you are more likely to be seen by people searching for exactly what you offer. But what can a business do to boost their SEO? To start, you should be using relevant keywords in your content. Adding more valuable content to your website also helps. Boosting SEO might also mean adding metadata, tags and headers to your content so that search engines can easily recognize, understand and recommend your site to users. Although direct traffic is certainly good to have, organic search traffic is the best way to drastically increase your lead pool. In order to boost SEO, you need to use the right keywords. Knowing what those keywords are, however, can be challenging. You should take the time to conduct some research to identify which keywords will be the most helpful and connect your content to the right leads and potential customers. While this may appear like a good place to start, try typing those search terms into a search engine like Google. You’ll likely get hundreds of millions of results. Unless you’re one of the biggest brands on the planet, you won’t be able to compete with such broad keywords. If you’re still struggling to find relevant keywords that can boost SEO, then consider using some of the popular keyword research tools. Just a few of the most effective tools include Google’s AdWords Keyword Tool, KeywordEye and Ubersuggest. Keyword optimization and research are both excellent ways to increase leads. In order for both of those strategies to be effective, however, you need to produce high-quality content. Content is all of the videos, photos, white papers, blog posts and copy found on your website. Search engines need to recognize the quality of the content, but users also need to find value in what you produce. Great content is the foundation for more leads, more conversions and more sales. Product descriptions are one form of content that can’t be overlooked if you’re working in the e-commerce realm. When prospective customers search for specific items, the content in a product description is often what will appear in search engine results. Those product descriptions, therefore, need to be crafted carefully. Simply adding keywords to a jumble of text won’t result in leads. Product descriptions must also stand out, so they can’t be copied from other sources. Taking the time to create original, unique content for a product can help it be seen by more people. Quickly churning out subpar content was once a strategy for websites, but that has long been considered a misguided approach. If you create subpar content, search engines like Google and Bing will penalize your website, pushing you further down the list of search engine results. Customers will also recognize this poor quality and thus leave your website, have an unfavorable view of your brand and even move on to your competitors instead. If your content isn’t leading to conversions, it might be time to take a look at some of the most common culprits. First, consider your formatting. If paragraphs aren’t easy to read or the font is unusual, then a few tweaks could be a serious improvement. Then, examine the quality of the writing. Is it delivering helpful information, or is it providing entertainment? If it isn’t valuable to readers, then it is time to make a change. Content is one of the best ways for you to stand out as a leader in your industry. You can market your products, improve your brand image and look professional among a sea of competitors. If creating quality content isn’t something you can fit in your schedule, or if your skills lie elsewhere, then hiring a copywriter can be a smart way to generate better content on a regular basis. Another way to increase leads is through an email list. The easiest way to do this is to add an opt-in form somewhere on your existing website. That way, anyone interested in learning more or receiving regular emails from your brand can opt in and do so. Of course, not everyone is eager to opt in without something in return. That’s when incentives, also known as lead bait, can come in handy. Offering an incentive like a downloadable e-book or a coupon for a discount on a future purchase can convince users to put themselves on your email list. Emails are a great way to remind customers of your brand. 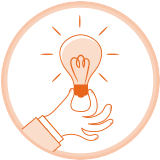 You can share relevant information, introduce new products or offer deals to subscribers. Email is an excellent strategy to stay in touch with leads and help push them to the next stage of completed sales. If you want to increase your leads, consider the biggest audience possible. It is hard to imagine a bigger audience than that of Facebook. Currently, there are more than 2 billion active Facebook users. Add to that total the users on other social media platforms, and the numbers are astronomical. Whatever products you might be selling, being active on social media is key. For the most part, social media allows you to attract new eyes to your brand, content and products for free. By posting relevant content and using hashtags, you can widen your potential audience. If you create valuable content, your followers might even share it for you. This widens your audience further, and it involves minimal effort on your part. Consistency, however, is vital if you want to maintain your audience. Since social media is about building trust and customer engagement, it is something that deserves regular attention. Advertising can be one final way to increase leads online. While this won’t be free, it is an effective tool to widen your reach and grow your audience. If you want to increase revenue online, then it makes sense to advertise online. You can advertise on social media networks by boosting individual posts, or you can pay to appear on search engine results pages. You might also work with a digital advertising agency or invest in ads along the sidebars of specific industry-related websites. Ultimately, the best kind of advertising will depend on your profit margins and your audience. However, remember that advertising campaigns can only work long-term if leads are being directed to quality websites that contain valuable content and relevant products. Congratulations, you’ve accumulated a lot of new leads! Whether through social media activity, advertisements or organic search traffic, acquiring new leads is a wonderful accomplishment. Once you have new leads, however, it’s important to act quickly and efficiently in order to convert as many of them as possible. These suggestions can help you increase your e-commerce conversion rate and ultimately wind up with more sales. A CTA is a call to action, or the text that prompts users to click and take the next step. A CTA is often the final step before a conversion. As a result, a CTA needs to be persuasive and encourage people to take the desired action. However, it can’t be too forceful, or it might actually discourage people from taking that action. One of the best ways to improve the wording of your CTA is to utilize verbs. Telling users exactly what to do with words like “click,” “download” or “sign up” can be incredibly effective. Also, make sure the value proposition is obvious in the copy. What will users receive if they follow the CTA? If they know what to expect, they will be more likely to follow through. It is common to see CTAs that offer a phone number that customers can call or hyperlinks they can click on. These can be effective, but there are other ways to establish a call to action. A call to action button, for example, can make it abundantly clear how to take the next step. You might opt to have a CTA button that is in a bold color, which makes it easier to spot on the page. You can also ensure that the CTA button takes users to a specific landing page for the next step in the conversion process, such as the product page where customers can place their order. When increasing e-commerce conversion rates is your goal, a CTA button can be a smart option. Every single day, internet users are bombarded with advertisements, messages and calls to action. Not only does your business need to stand out from the crowd, but it also needs to be a credible e-commerce website. There are lots of scams out there, and plenty of users don’t want to send their email, contact information or credit card details to an untried company. To ensure that this isn’t an obstacle on your quest for conversion rate optimization, take steps to boost your credibility. If your business belongs to a well-known organization, include the seal somewhere on the homepage. If an employee has worked with a world-renowned company in the past, include that detail. All of these extras encourage users to feel safe and trust your brand among a wealth of other options. With an increasing number of individuals doing all of their online shopping from mobile devices, few e-commerce companies would dream of forgetting a mobile-friendly website. However, mobile-friendly and mobile-responsive aren’t always the same thing. A mobile-friendly website means that a user can utilize all the website’s functions from a smaller screen. While that is certainly a step in the right direction, it’s not enough. When it comes to conversions, are buttons visible to mobile users, or are they squished to one size of the page? Are the buttons clickable, or do users have to scroll down the page and navigate your website on their own? Optimizing your website for mobile users is essential to increasing your overall conversion rates. Although you should work hard to make your content interesting and valuable all the way through, the reality is that not everyone will make it to the bottom of each page. 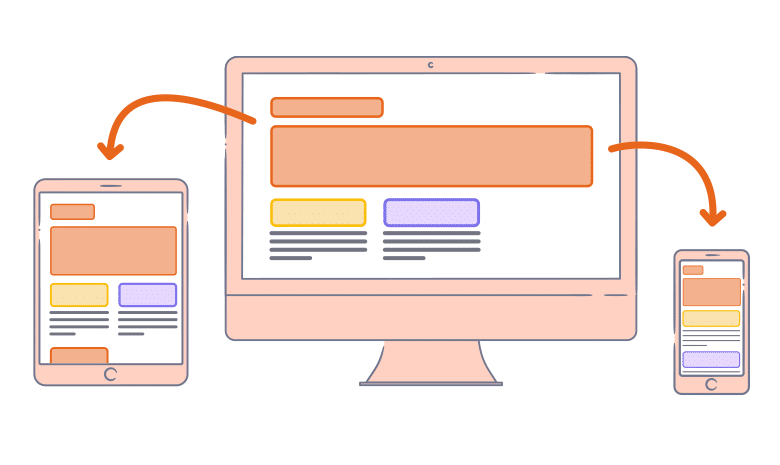 If your conversion fields and CTAs are always at the bottom of the page, you could be missing out on a lot of potential conversions. While there is no guaranteed best place to put a CTA button or an opt-in field, adding them above the fold is a savvy move. This ensures that visitors who just briefly visit your page still have the opportunity to learn more and take the next step. When a user clicks a link and heads to your website, where do they end up? If your goal is to increase conversions, then those users should be directed straight to a dedicated landing page. This landing page is customized to users’ needs according to how they clicked through. If a user clicks through a boosted Facebook post in order to receive a discount on your products, encourage their conversion. Instead of sending that user to your main website, or even to a page that includes conversion fields, send them to a page dedicated to collecting their information. By entering their email address and name into a field, they can receive the discount they desire. This dedicated, straightforward approach ensures that people stay on track and complete the conversion. Too many options, and users might get distracted before completing the process. As you consider metric conversion rates and search engine optimization, it is easy to forget what leads really are: people. A conversion means that you’re helping a person find what they are looking for. The best way to increase conversions is to create a better user experience. In online sales, as in virtually all areas of life, people respond well when they see that friends, family and peers have tried something first. For that reason, adding social proof to your e-commerce website can greatly increase conversion rates. One example of social proof is the customer testimonial. A testimonial or a review can be a great way to showcase customer satisfaction. If possible, have reviews focus on customer journey touchpoints. Pointing out that customer service was great, shipping times were fast or materials were high-quality can eliminate common concerns before they even have a chance to develop. That social proof will be more appealing if the review is linked to a real person with a picture or even a social media link. Better yet, encourage satisfied customers to leave reviews on multiple online platforms. Many would-be converts will check for reviews before closing on a conversion. Conversion optimization is not one size fits all. Each business will need to try new things and see how their audience responds. Sometimes, tweaking just one small detail can go a long way in increasing conversions. This process is known as A/B testing. For example, you might have a successful blog post with a clear call to action at the bottom. To maximize the success of this blog, you could try a wide range of call to action examples. Your results might reveal that one particular CTA is the most successful. Armed with this knowledge, you can replicate that success across all blog posts. Unfortunately, far too many e-commerce websites try their hardest to increase conversions without properly monitoring or analyzing their results. Without proper tracking, it is impossible to know what is working and what isn’t. By looking at results, you can see which pages are generating more conversions and which are failing. You can repeat especially popular blog posts, or you might copy strategies for effective social media posts. You could cancel ad campaigns that aren’t connecting with leads, and you can reinvest in platforms that are outperforming when it comes to conversions. In short, you won’t know if your efforts are truly working until you are able to analyze the results. In the world of e-commerce, finding and converting leads is a big deal. By increasing the number of leads you have and then boosting your conversion rates, you’ll be able to connect with and sell to a larger group of people.